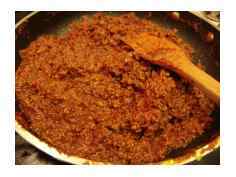 This is a Sloppy Joe recipe that I experienced in a Chicago restaurant. I asked the server to tell me what was in it, and surprisingly, he happily obliged with a rough description. It's the best Sloppy Joe sandwich I had ever had, until mine of course. The two things that made it unique were the grilled Texas toast it was served on, as well as the inclusion of pulled pork. Because of the inclusion of pork, I call mine "Sloppy Poe." In my Sloppy Joe recipe I use some leftover pulled pork that has great smoky flavor. I cover it all in the video. If you don't have pork available, this recipe is still outstanding with just beef. Just add additional beef to make up for the pork. What made this video fun was that I came up with the recipe myself and then Howard Cosell himself called me from the after life. Quite a day. I hope you enjoy this unique Sloppy Joe recipe! 2 Tablespoons of Minced Garlic: This should be fresh. Saute' the onion and garlic in butter and olive oil until translucent. 1 Teaspoon of Dried Marjoram: Add to the garlic and onion halfway through the saute'ing process. Set mixture aside. Brown beef with kicker and remove fat. Once browned, add back onion mixture. 1/2 lb of Pulled Pork: Add to the browned beef. If you have no pulled pork, simply brown 2 lbs of beef versus 1 1/2 lbs. Now simply add these ingredients to the mixture. Simply cook over medium heat to intensify the flavors and to thicken. 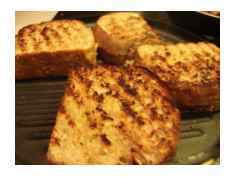 Serve on Texas toast as I describe it in the video. Add some mild peppers and shredded cheddar cheese. Enjoy! Leave Sloppy Joe Recipe and Return to BBQMyWay Homepage.